DEBORAH CROMBIE: Picture a cold, clear day in in London a few weeks back. I had missed lunch and walked miles. And miles. At last, just a bit before seven o'clock, I reached St. Pancras Station. 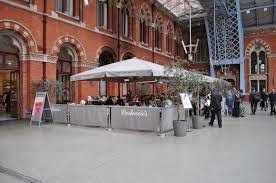 In those hours of walking I'd decided I would treat myself to dinner at Carluccio's in the upper concourse at St. Pancras before heading back across London to my temporary flat. There was a queue snaking from the entrance to the restaurant's patio--a half hour wait. I'd hit it right at the busiest time. for the starter, I thought, then ravioli. When my turn came to be seated it was worth the wait. I got a table under a heat lamp on the patio, with a perfect view of the arriving and departing Eurostar trains. Bliss, made even better by a glass of wine and the day's newspaper. And then the pate arrived, in a perfect little pot, with crisp slices of toast and onion relish. I had eaten Carluccio's chicken liver pate before, a number of times, and loved it. But that night I thought I had never tasted anything quite so good. I came home dreaming of chicken liver pate. (I think I was missing London, and the small but perfect moment of that dinner...) I soon discovered that almost every famous chef has a chicken liver pate recipe. But which one to try? I decided I would start with one by Felicity Cloake, the food writer for The Guardian, who deconstructs chicken liver pate in a great article. 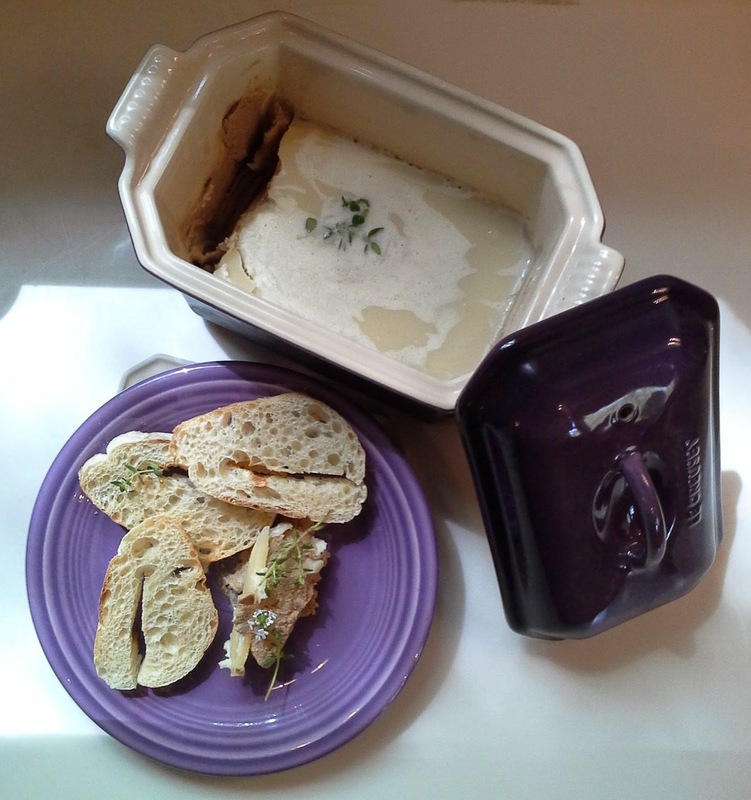 I even bought my very own pate dish to put it in. The result? Fabulous, even on a first try. (Although I would need to double the recipe to fill my dish.) I can't say it's as good as Carluccio's, not without tasting them side by side, but close enough to make me happy. But I am certainly will to try a few more recipes! And here is a photo of mine. REDS and readers, do you have a chicken liver pate recipe? Please share! And have you ever tried to recapture a perfect moment with a recipe? Your pâté recipe sounds wonderful; thanks for sharing. Cover 1/3 cup dried currants with boiling water; soak until plumped, about 6 minutes. Drain; pat dry. Melt 4 tablespoons unsalted butter in a heavy twelve-inch skillet over medium heat. Add 3/4 finely chopped onion, 1 finely chopped garlic clove. Cook, stirring occasionally, until softened, about 8 minutes. Trim, rinse, and pat dry 1 pound chicken livers; season with freshly ground salt and freshly ground pepper. Add chicken livers to skillet. Cook about 10 minutes, until almost cooked through, with livers slightly pink inside. Add 1/4 cup Cognac; simmer about 2 minutes. Add 1/4 teaspoon freshly grated nutmeg, pinch of ground allspice, 1/4 teaspoon freshly ground salt. 1/4 teaspoon freshly ground pepper. Purée until very smooth, about 1 minute; transfer to bowl. Stir plumped currants into the pâté; pack into a crock [or several small crocks], cover with plastic wrap, refrigerate at least 6 hours. Bring pâté to room temperature; serve with toast or crackers. I LOVE chicken live pate though I realize I haven't made it for years. And years. SO RICH. This is from the out of print Michael Field's Cooking School, source of many spectacular an worth-the-trouble recipes. Easy to make, keeps well, and can be frozen. ALL THAT butter adds up to: 1/2 lb. 1. Melt first 3 T butter in frying pan; add onions and shallots; cook 'til softened and lightly colored. Mix in chopped apple; cook 'til soft enough to mash with a spoon. Transfer whole mix to food processor or blender. 2. In same pan melt the next 3 T butter over higher heat; when butter stops spitting throw in chicken livers. Cook over high heat 3-4 minutes. When brown on inside an pink inside remove from pan an flame with 1/4 c warmed calvados or applejack. Add liver & juices to apple/onion mix in food processor, add 2 T cream and blend at high speed. MUST BE SMOOTH. Scrape it out into a mesh sieve set over a mixing bowl and rub the paste through with the back of a large spoon. Let it cool. Pack into dishes an smooth the top. Cover with saran wrap touching the top of the pate to keep it from coloring while it chills. Chill at least 3-4 hours. Serve with good french bread. I will be two weeks in London this summer, and just noted down the pate place . . . I am so excited. I am actually happy with any form of chopped liver, but this sounds elegant. Oh, my. I love chicken liver pâté but also haven't made it in years. Thanks for the recipes, and I love your story of the long walk and the reward, Debs. What a lovely piece, Debs - Thank You!! I love when we share recipes. The only pâté I have ever made is a Country pâté I copied out of Bon Appetit about a million years ago. I make it maybe once a year (maybe) for our neighborhood Christmas party. Looks great, Debs! 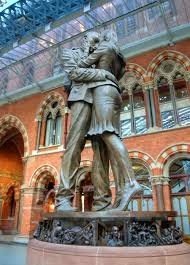 And I love the photos from St. Pancras Station. The Lovers especially! I have a beautiful recipe but only if you'd count my great-grandmother Otylia's chicken liver kishka loaf. Perfect for Sunday afternoon. Love pate. Have a recipe that sounds similar to some of these--Madeira, lots of butter, some love it, some hate it at parties. I even loved chopped chicken livers at the deli. Wish I had more friends I could cook even plain calves liver for--once an adult I learned to do it so it doesn't taste and feel like shoe leather. Julia Child's Chicken Liver Pate in her original Art of French Cooking has been my go to for years. Joan, the pate with currants and brandy sounds wonderful. Hallie, I love the idea of adding apple. I would have tested your recipe first but I didn't have the Calvados. Do you think it would be okay to substitute brandy? The recipe I used doesn't have quite as much butter, and about a third of it is poured over the top, so that people could avoid it if they liked. But I loved the layer of butter on the top, and think if you're going to eat something like chicken liver pate you should just go the whole hog, so to speak. Enjoy! It's not something you have every day. Lucy, I'm not big on liver generally, so interesting that I love this so much. One of the keys to good CLP seems to be pushing it through a sieve at the very end--removes any graininess in the texture. Reine, if you haven't already done so, follow the link I posted for The Meeting Place. The sculpture is breathtaking, but what you don't see in a photo that focuses on the lovers is the frieze beneath their feet. Wonderful story-telling. It's a pate party! Fabulous. I adore it. I confess that I've never had chicken liver pate. However, as someone who loves chicken livers, I can imagine that I would easily become a fan. On my bucket list now is to have some chicken liver pate. And, Debs, aren't those culinary moments of delight such a treasure! I clicked on The Meeting Place link you provided, Debs, and is history and creation fascinated me. The frieze that was added must be quite an interesting piece of history of the station. Thanks for starting out my Sunday with an addition to my bucke list and another must-see and must-eat-at place in London. Thanks, Debs! 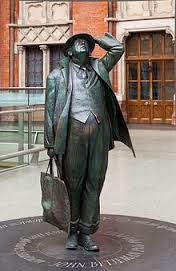 I'll look for other photos of the statues. I saw that there's a frieze around the base of the lovers. Tomorrow I'll go online and hunt up an article about it. There should be a discussion of the art online.